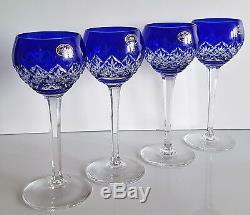 FOUR AJKA CASED CUT TO CLEAR LEAD CRYSTAL WINE HOCK GLASSES, COBALT BLUE. 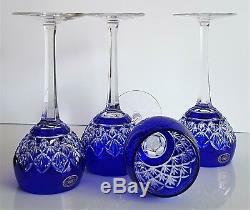 Genuine cased, hand cut and mouth blown crystal. Material: 24 % lead crystal. No chips, cracks, or repairs. Height: 17,5 cm / 7. Weight: ca 200 grams / 1 piece. Any white or bright spots are due to camera flash or camera angle. Variations in handmade crystal, as all pieces are individually cut. Minimum difference size, weight and color. Natural occurrence in the manufacturing process of mouth blown, hand cut crystal. 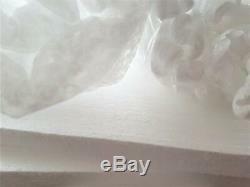 (bubble film, Styrofoam table & chips, carton box). If you have any questions, feel free to ask! Please check the other items! 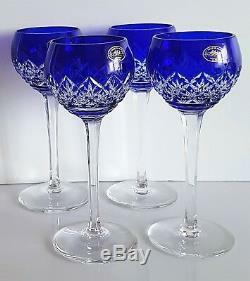 The item "FOUR AJKA CASED CUT TO CLEAR LEAD CRYSTAL WHITE WINE HOCK GLASSES, COBALT BLUE" is in sale since Saturday, October 20, 2018. 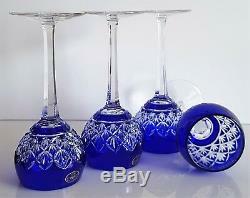 This item is in the category "Pottery & Glass\Glass\Art Glass\Bohemian/Czech\Other Bohemian/Czech Art Glass".